Students in this pathway have accomplished a lot! Benchmark recruit for In House Training Videos. Multiple Award Winning shorts Oxnard Film Fest, Reflections, Young Arts etc. Industry Guests from Spielberg's Assistant Director to writers for the Simpsons. 20th Anniversary SSHS Documentary. Alum Key PA on Grey's Anatomy, Lighting/Rigging Grip on Avatar sequels. Student work screened at Studio Movie Grill. Student work distributed on syndicated series Mini Movie Hour. 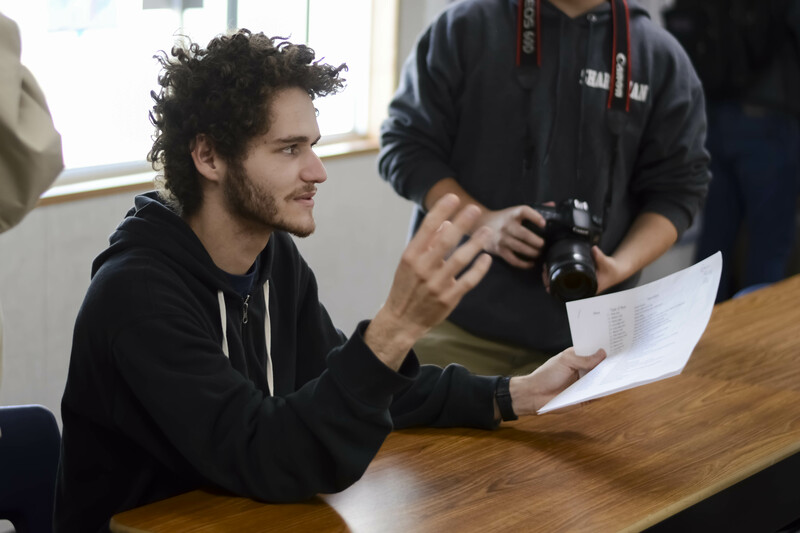 The Academy of TV and the Art of Film at Santa Susana High School is a a nationally recognized and awarded Video Production and Media Arts program. Academy of Digital Media and Production is a comprehensive, Honors, nationally recognized and awarded Video Production and Media Arts program. The classes are designated CTE (Career Technical Education) and ROP (Regional Occupational Program) which means the classes are run by working professionals whose purpose is to prepare students for the professional standards of the studied field-- the capstone class is run like a production company. Our students have gone on to prestigious film schools (NYU, Chapman, UCLA, etc.) and others have secured immediate employment in the Hollywood industry upon graduation on such shows as Grey’s Anatomy and the upcoming Avatar sequels. The students learn the varied skills of production from writing, directing, producing, cinematography and art direction to non linear editing, SFX, sound and audio design among other emerging disciplines to the film and television industries.The students are immersed in the language of cinema so they will be media literate and understand the unique skill set needed for effective film and video communication in the post-literate 21st Century job market (as opposed to other methods of verbal and written communication). Industry field trips to studios, production companies and other relevant businesses occur throughout the pathway. Internships and job shadow opportunities are also available. The students are eligible in their junior and senior years to petition for UC college credit in the ROP Honors course. The students learn post production software from the Adobe Suite (Premiere, After Effects etc.) to DaVinci Resolve (digital editing, compositing, audio editing, color correction and more). Students who graduate from the SSHS Film, TV and Media arts pathway exceed the skills of most other students entering film schools and even entry level industry jobs. This is a two period, two semester full year Honors course (weighted grade) and the capstone course of the TV, Film and Cinematic Arts pathway. The class is essentially a student run and instructor guided Production Company. The students are responsible for the project management at least two school sponsored film festivals, fundraising for the program and individually producing four film/video projects throughout the course of the year. The students are also given the opportunity to be “hired” for video projects by our school departments, members of the community and other entities that have a need for media production. ROP certification through the county and 3 units of UC college credit available if students meet designated benchmarks. Repeatable for credit (Prerequisite: Intro to Film). This is a two semester full year certification course which teaches the interface and tools of Adobe’s Premiere editing program as well as how to integrate the tangential programs of After Effects, Audition, Photoshop etc. The course also explores the post production workflow of DaVinci Resolve (the industry’s standard for Color Correction and Grading) that takes the students through Media Management, Digital Editing, Compositing, Color Correction, and Media Distribution. Industry certifications available upon completion of certified skills test. (Not Currently Offered) (Prerequisite: Intro to Film). This is a two semester full year course that is same as ROP Media Production class but does not include honors credit, college credit or certification opportunities. Students are required to individually produce two projects throughout the course of the year. (Prerequisite: Intro to Film). This is a two semester full year independent study course only offered to the highly advanced and self-motivated student. Student is responsible for securing their own internship on a film set, studio, production company or other film, tv and media related company for a minimum of 40 hours for the semester as well as producing one industry standard, festival-ready 10-20 minute digital video short (narrative or documentary) that must be submitted and accepted to a contest or film festival. (Prerequisite: ROP Media Production) (Not Currently Offered). Must take Honors ROP Media Production capstone class and complete a senior project in film.